Electric and Acoustic Guitar Recorded February - September 2009 Cleveland and Westlake, Ohio by Mark McGuire. Percussion on "Brothers" Performed and Recorded November 2008 at Zombie Proof Studios, Cleveland, Ohio by Nate Scheible. Tape Samples Recorded 1991 - 1998 by Mark McGuire Sr., Jr.
Edited and Arranged by Mark McGuire 2009. Layout by Mike Pollard and Mark McGuire. Mark McGuire operates chiefly as guitarist in the legendary Emeralds., however he also has racked up an impressive set of solo releases over the last few years (albeit mainly in small to micro print runs). 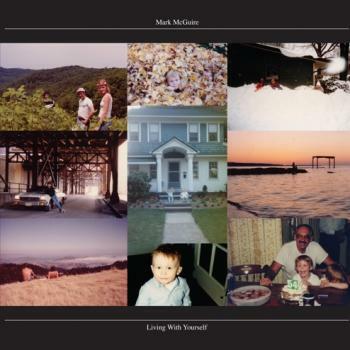 Living With Yourself is his new album and we at Editions Mego hope to meet any demand which may arise from this fine selection of modern crafted guitar tunes. Focusing on his family, early friendships and the problems that inevitably develop through years of knowing someone, it takes McGuires sound even further out, and contains some his most accomplished songs to date. The opening track is fine example of McGuires magic technique of taking a lone acoustic guitar then transforming the track into bliss-out electro wash looping off into the distance. And tracks like ‘Clouds Rolling In’ and ‘Brain Storm’ take off where such McGuire classics as ‘The Marfa Lights’ (which incidentally is planned for a future reissue) left off. While connoisseurs of his sound will find all they desire in here, many superb surprises await around every corner. These are songs that cruise, bubble and rise to the top. Available as LP vinyl and CD in digipack.